OXFORD, Miss. – The University of Mississippi’s College of Liberal Arts has presented its first-ever Research, Scholarship and Creative Achievement Awards to three outstanding faculty scholars. 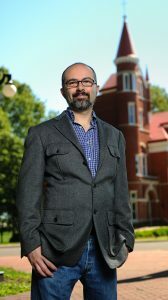 The new award, which will be presented annually to tenured liberal arts faculty members, recognizes “sustained exemplary performance in research, scholarship and/or creative achievement at the national and international level.” The 2017 winners are Emanuele Berti, professor of physics and astronomy, who was recognized for work on gravitational physics; Robbie Ethridge, professor of anthropology, who was recognized for her work on the ethnohistory of Native Americans in the South; and Jaime Harker, professor of English, who was recognized for work on women’s and gender studies. This year’s winners are some of the university’s strongest scholars, said Charles L. Hussey, professor of chemistry and associate dean for research and graduate education. 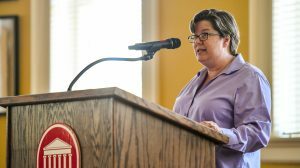 “This is the first instance that the College of Liberal Arts has given such awards to established faculty members,” Hussey said. “The three individuals who were chosen for these awards represent the very best scholars that the college, if not the university, has to offer. Chosen from among all categories of liberal arts disciplines, the recipients have achieved scholarly recognition and influence well beyond the Ole Miss campus. Each receives a $2,000 cash prize and a medal presented at the College of Liberal Arts graduation ceremony in May. 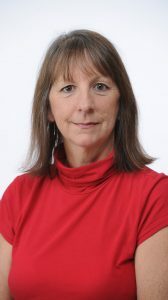 Harker, who also serves as director of the Sarah Isom Center for Women and Gender Studies, said she feels honored to be among the first awardees. “I am delighted to be one of the inaugural recipients of the 2017 Research, Scholarship and Creative Achievement Award,” Harker said. “Valuing humanities research is important, and so is recognition of interdisciplinary scholarship like gender studies. The creation of the award reflects the university’s renewed emphasis on science, technology, engineering and math education, Berti said. “I am happy and grateful for this award,” Berti said. “For me, it is particularly meaningful because it recognizes the growth of the gravity group, of the physics department and of the university as a whole as one of the leading research institutions at the national and international level. Ethridge said she is honored to be included among this group of esteemed scholars. Department chairs and tenured faculty members with the rank of professor are invited to submit nominations. Each nominee’s unique contributions to research, scholarship and/or creative achievement, as well as the candidate’s CV, are evaluated by a select committee. The dean’s office will solicit nominations from all college departments by March 1 of each year. More information on the nomination process can be found here.